Gabrielle Bernstein shares her tips on how to meditate your way to happiness daily. There’s more to leading a healthy lifestyle than following an eating and exercise plan. Finding happiness in your everyday life can also make a positive impact on your overall health. According to a study in the Proceedings of the National Academy of Sciences, happiness has a positive effect in lowering cortisol levels, the stress hormone that is related to health conditions like type 2 diabetes, hypertension, and autoimmune diseases. But if you aren’t feeling that happy on a daily basis, what can be done to change that? Gabrielle Bernstein, New York Times best-selling author of May Cause Miracles, believes personal happiness — or as she refers to it, “miracles” — can be achieved through meditation. In her newest New York Timesbest-seller, Miracles Now, she writes that meditation helps “because it gives you time to reflect, bring inner peace, and make a true assessment of where you are in your life and where you can go.” Indeed, a study from JAMA Internal Medicine shows that meditation can help reduce stress and ease symptoms of anxiety and depression, which are related to myriad health conditions. 1. Make your first thought of the day a happy one. “When we look at ourselves in the mirror every morning and think of all the things we want to change, that’s a choice we make,” says Bernstein. “Make the commitment to think differently about yourself and make happiness the first thing of the day.” She recommends listening to music to begin your morning instead of watching TV. 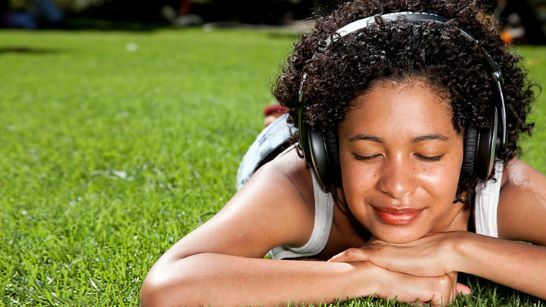 Create a positive, uplifting playlist to help boost your mood and brighten your spirit. If you have a few minutes, sit still and meditate while listening to a song or two. 2. Snap out of a negative mindset. Plagued by undesirable or destructive thoughts about yourself or others? Bernstein recommends employing her “Snap Out of It” meditation technique, in which you wear a rubber band on your wrist, and whenever you start to think negative thoughts about yourself or towards another person, flick the rubber band against your arm. This will literally help you “snap” out of the negative thoughts. 3. Unleash your inner child. Whenever you feel stressed about your responsibilities and commitments, unplug from the world, shut off your computer and phone, and tap into your inner child. When we become more childlike, we grow our capacity for curiosity and creativity. Bernstein recommends taking a dream break during the day, in which you sit alone and spend five to 10 minutes thinking your way into a cool experience you’d always hoped to have. “Open up to silliness and having more fun. That childlike energy brings us a much more positive perspective and releases tension,” Bernstein says. 4. Sleep to restore your mind. Sleep is essential to optimal health, but people often forget that it is also a spiritual practice that benefits us mentally and emotionally. Lacking essential shut-eye is another way we block happiness from our lives. To help you get a restful night of sleep, Bernstein recommends using this simple Kundalini breathing technique: Sit up straight on your bed and breathe in using a U breath (Pucker your mouth as if you were holding a coin between your lips.). Breathe in and exhale through your nose. Continue this cycle of breath for one minute.